Our installers can transform a dull area into an eye-catching one where you can relax and unwind. Great for entertaing friends having a BBQ or just lounging around. 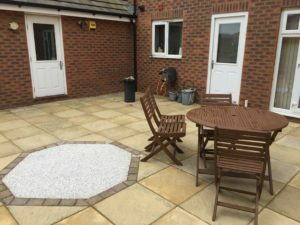 We can work to different garden patio designs using a variety of paving stone or a mixture of paving and Resin Bound or Block Paving to create something extra special. Various Manufactured Concrete Slabs, many of which resemble natural stone at a much cheaper cost.